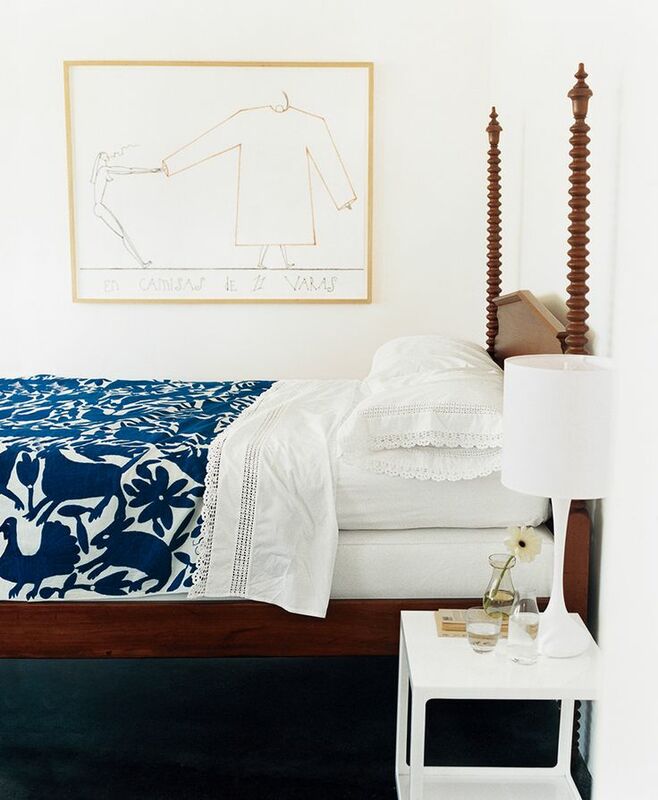 Our guest room is the one room I didn’t share in the Design*Sponge tour, and there’s a reason for that. It’s dingy and stuffed with furniture, and long overdue for a little revitalizing. You may remember that I posted a while back about whether to claim this upstairs bedroom as our own, or to move downstairs into the big room. The votes came in overwhelmingly in favor of the downstairs room, but we decided on a gradual plan: we’ll make the upstairs room ours for now, and in 7 or 8 years we’ll move down to what is now the playroom. As part of the plan we’re having a closet built in the playroom that can be used as a home office (having it upstairs didn’t really work for us) that can later be easily converted into a normal closet. For the foreseeable future we want to be upstairs close to Opal’s room, but as she approaches teenager-dom a little space will probably be welcome, and we’ll move downstairs. 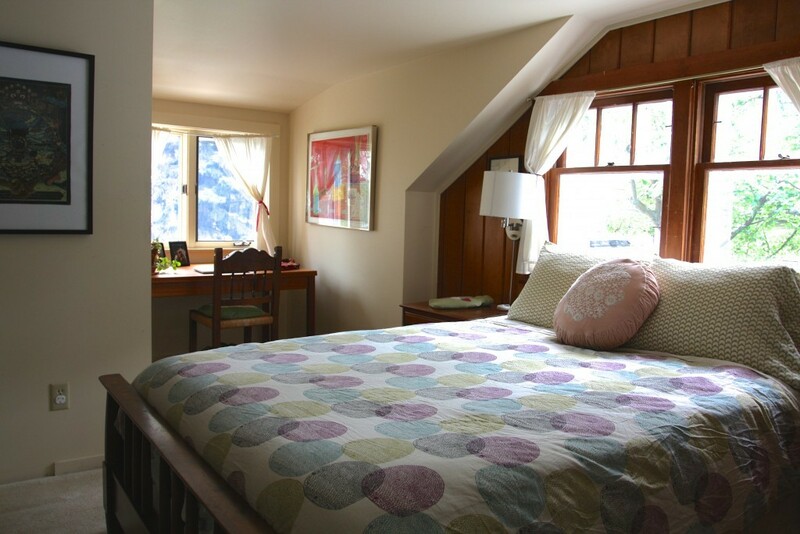 The driving force behind the move to this room from our current bedroom is closet potential. There is already a small closet in the guest room, which Chester uses because the little closets in our bedroom are full to the gills of my clothes. BTDubs, in photos this room always looks yellow, but in reality it is a sweet and mellow peach. Closet potential is the main impetus for moving to the guest room, and it also has the allure of being bigger than our current bedroom. That said, the room is not without dilemmas. Because the window at the end of the eave provides much needed light in the room, we won’t have a closet door. I’m hoping to hang a portiere or textile of some sort across the opening below ceiling height so that we still get the light in the room. The curtain will probably most often be open, but I’d like the option to close the closet off from view when things get messy. See any themes? 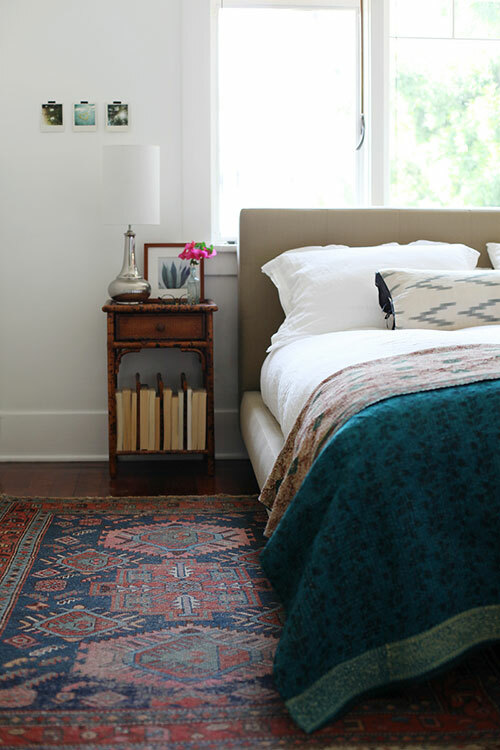 White walls, colorful rugs, upholstered headboards, and antique touches. Looking at these really helps me see how it’s going to come together. -Design and build closet in eave. 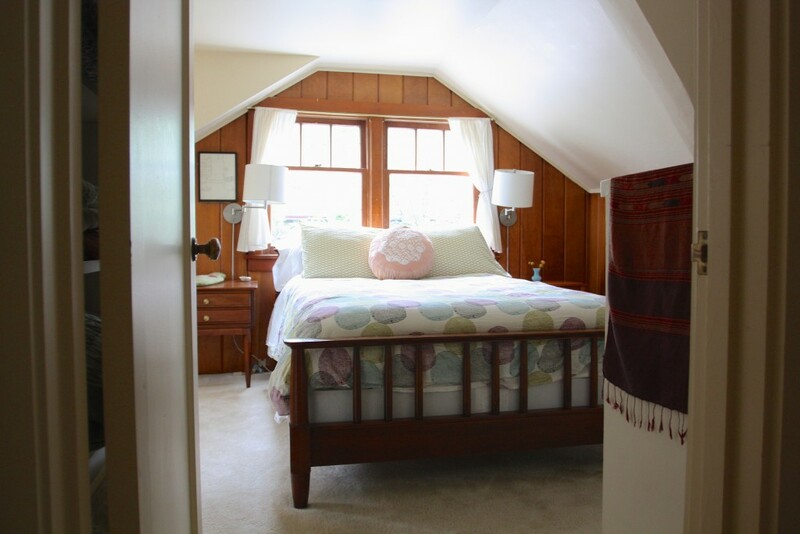 I also really really want to put a skylight into the sloped ceiling above the bed (we wouldn’t have to get up to watch the Perseid meteor shower, which is the only way I’m ever going to see it!) but our contractor has strongly advised against it because of ice damming. #Alaskaproblems. I’m really looking forward to having a closet plan finalized so I can start thinking about the fun stuff, like what fantastic textile to use as a closet door. 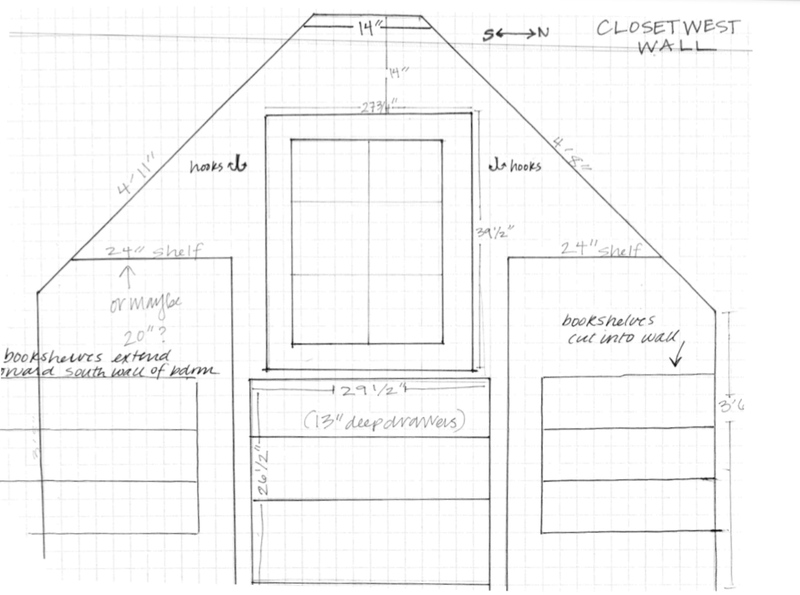 If you have thoughts about how to design a functional closet with seriously sloped ceilings, this is my earnest plea: please share your ideas in the comments! I need all the help I can get! Sadly, your earnest plea falls on my deaf ears because I have no ideas whatsoever! I just wanted to say that “when things get messy” sounds like a great title. For what, I’m not sure. If not a gritty, noir film or a self-help tome, perhaps a future RHW post? I love the shape of the room! The plans sound wonderful! 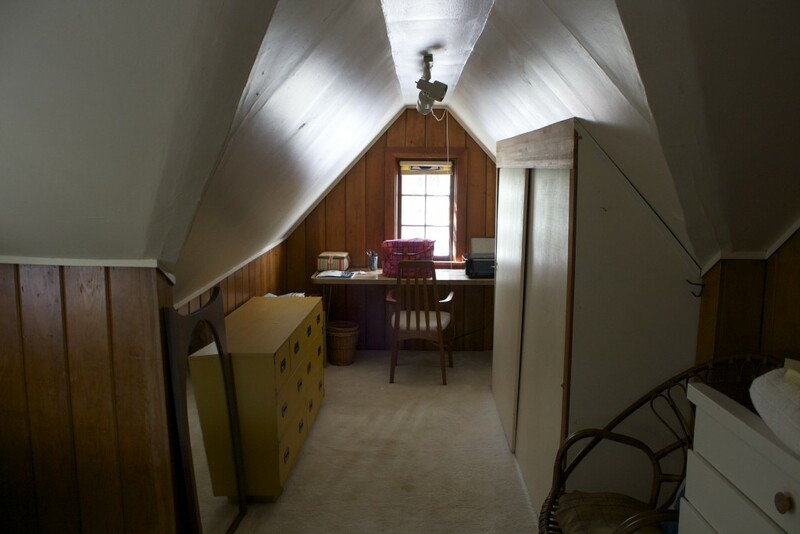 Will you have closet/shelves at both eaves where the desks are now? I am not an expert, but after our re-insulation project am very interested in cold climate building science. Your contractor is smart to caution you about the skylight (ice dams, loss of thermal efficiency, not to mention summer solstice!!). My only suggestion is to consider adding insulation at (what I think might be) the knee walls and the ceiling, if that hasn’t been done in the last 15 years. Oh Andrea, you’re so practical! I’m not sure about insulation in the knee walls, that’s a good one to ask about. The room is warm and cozy all winter, so I suspect we’re in fairly good shape. The other eave has a nice big window with a view out to the back yard and the mountains beyond, so I think we’ll probably put a cozy reading chair there. Thanks! I like all of your ideas although I have nothing to offer on how to make the closet really functional. 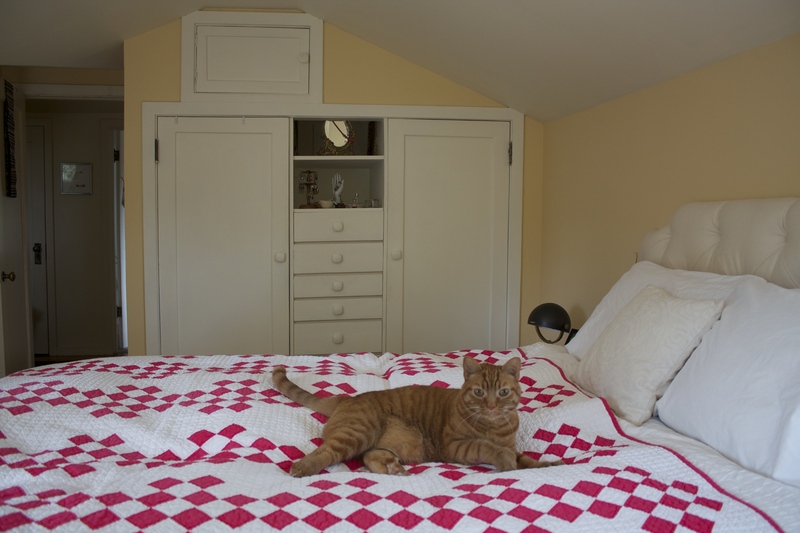 One trade for the nooks and crannies and the necessity of a pitched roof for snow loads is not so much in the way of closets. But, still, what fun to have the nooks and angles and to imagine your fine sense of how white and textiles work to keep it simple and elegant. Love your sourcing. I’ve had to live with many closets even on different floors when living in older homes. (and due to lack of space rotate seasonally) Even the grand craftsman we had at one time must have used freestanding wardrobes because the master bedroom closet was low and shallow. Thank you, Susan! I agree, even if the closet doesn’t fit all of our clothes, I love the cozy nooks and angles. I’m definitely the sort to sacrifice a little practicality for charm! A skylight in a sloped ceiling, reminds me of sleeping under one in the 7th floor attic of a 1700s building in Lisbon, Portugal. I had a mattress on the dusty wood floors in a cozy nook, with a small trunk, and that skylight, and it was magical. Bummer about ice damming! I wish my Debbie Carlos print (a different one, than the one hanging above the bed in your first inspiration photo), looked as nice without a frame, alas, a frame for that size of a print is pricey, but I do preferred art framed. 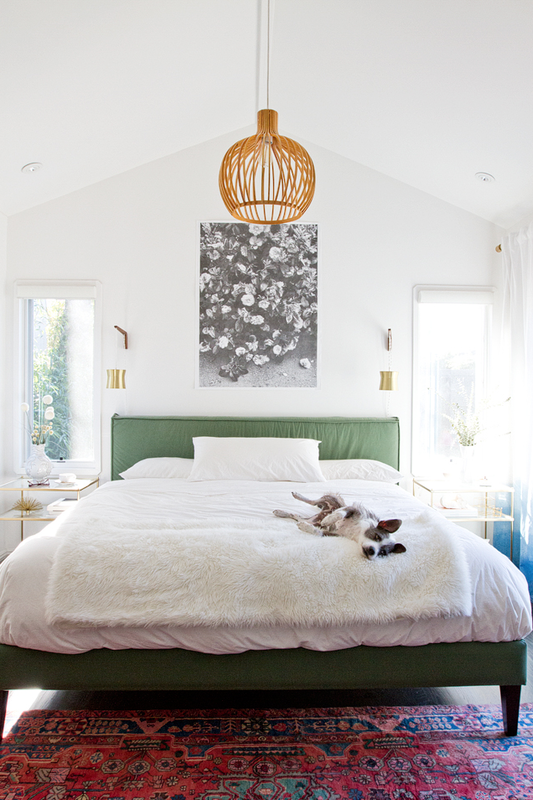 I love the otomi bedspread in the second photo, so beautiful! I’m afraid I’m no help with the closets, but hopefully you’ll find some help from other readers! 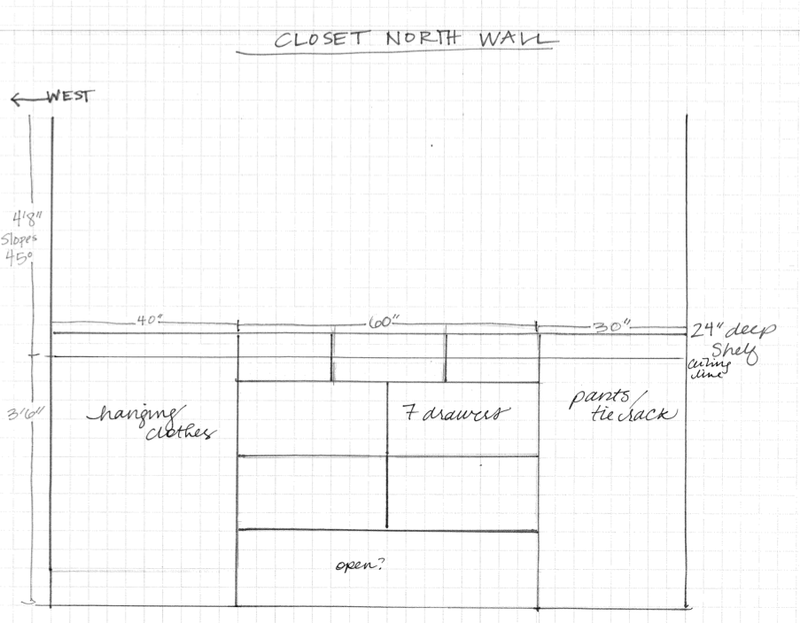 My linen closet has strangly angled walls and the shelves are very, very narrow…I’ve been trying to figure out solutions to get more storage out of all my closets, lately. Your Portugal digs sound spectacular! And you’re right of course, framing is highway robbery. Katie had some good ideas for DIY framing in a post a while back, you should check it out! My sweet mother-in-law has always had the gift of being able to cull her wardrobe to fit her closets. Sometimes I think that’s the only solution to closet space. Either that or mandatory uniforms. The bigger the closet the more stuff one collects. At least that’s what happens to me. I definitely fill all the space I’m given, but alas, I can’t say that a smaller closet keeps me from expanding my wardrobe. A major cull is definitely in order before we shift into the new space. Thanks, Carol! Noooo idea about the closets, sorry! 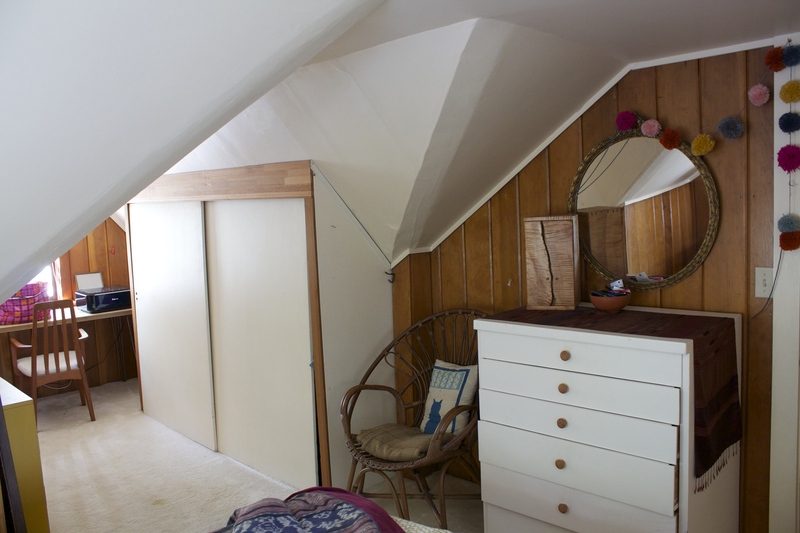 I grew up in an old miner’s house in Juneau with super slanted ceilings—all our stuff was kept in drawers that were built into the knee walls, plus a couple closets where the roof wasn’t so pitched. I don’t know if you have space to frame built ins? Mostly just commenting to vote for leaving the window wood unpainted at first just to see how it looks. I think it could be some nice warmth. Excited to see this room! 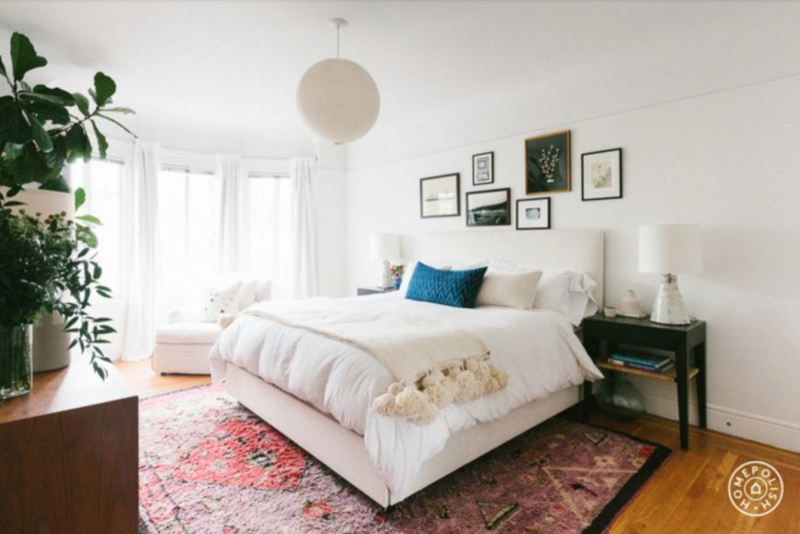 I love the idea of moving your master bedroom into this room—it has such wonderful light! I wonder, though, if you’ve considered not adding the closet but instead building the closet/dressing chambre of your dreams in the basement? 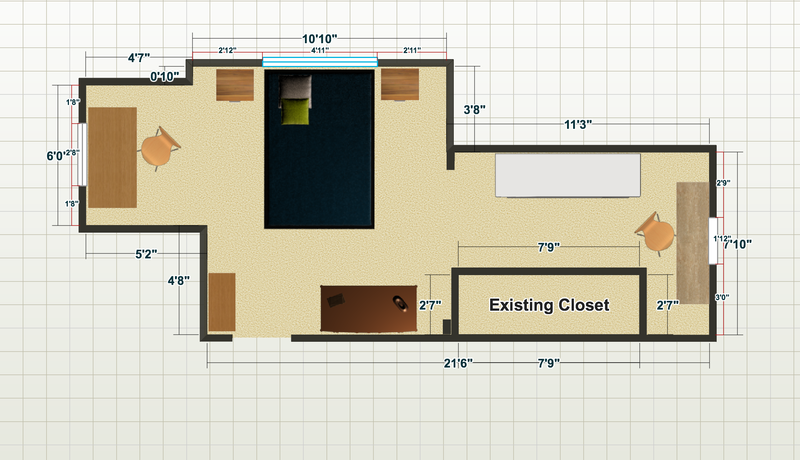 Even removing the existing closet from this room and opening up the space? I admit it would be inconvenient, but less so once you move to the first floor. All of your clothing could be in one gloriously organized space! And this space could be made to be very elegant and un-basement like. Full disclosure: I’ve just spent the past week poring over London apartment rentals and I’m completely enamored with small, quirky, angular spaces, and I’d hate to see you give up part of your room’s charm to a closet. I also think with the angles of the roof that your new closet may prove less than great. To have enough depth for hanging space I think you will end up with a rather tunnel like space. 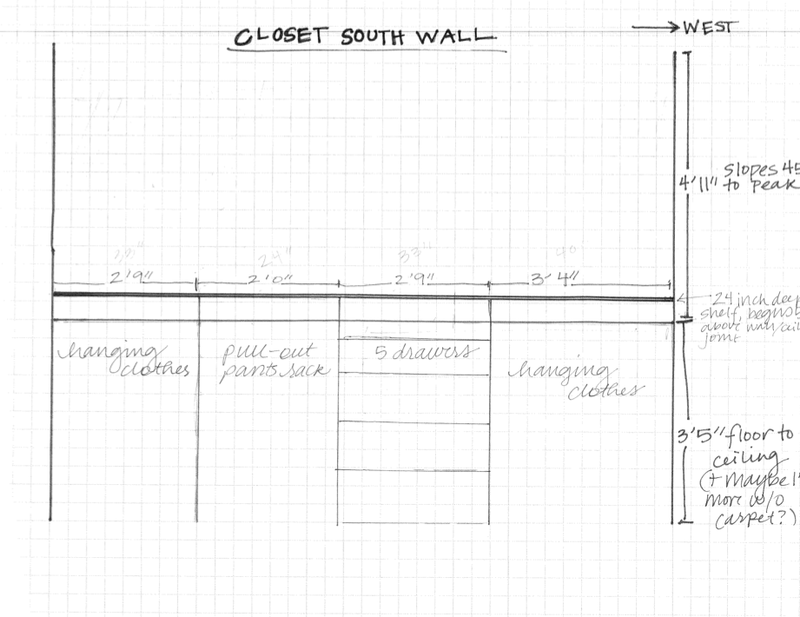 Finally, closets on exterior walls in Alaska can create serious moisture problems—the clothes can provide enough insulation that condensation will accumulate on the exterior walls…Ok, sorry to ramble on—I’m sure that whatever you do Mera it will be gorgeous! Sounds like a great plan to me! Do you have a local contractor you love? We have a long list of things to talk about with someone, so we can begin to prioritize. Thanks!